The Most Reverend Doctor Robert Francis Jangro, O.SS.T., O.C.R. Ecclesiastical heraldry is the tradition of heraldry developed by Christian clergy. Initially used to mark documents, ecclesiastical heraldry evolved as a system for identifying people and dioceses. The shield is the core of heraldry, but other elements are placed above, below, and around the shield. The entire composition is called the achievement of arms. The shield is White (Argent) symbolizing peace and sincerity. The hat called a galero (or gallero) is a distinctive part of the achievement of a Catholic cleric. The galero is ornamented with tassels (also termed houppes or fiocchi) indicating the cleric's place in the hierarchy. An archbishop’s galero is green with ten tassels on each side. Green (Vert) symbolizes hope, joy, and loyalty in love. Academically, it also represents the field of medicine and symbolizes Archbishop Jangro’s Christ-centered healing ministry as a Board Certified Doctor of Naturopathy and Cognitive Behavioral Therapist. No image permeates Christian art as the image of the Madonna and Child. The Madonna and Child in the upper left corner of the shield is a representation of the Virgin Mary holding the infant Jesus and symbolizes Archbishop Jangro’s membership with the Order of the Most Holy Mary Theotokos – “Benedictines of Mary, Old Catholic Marianists”, his position as Founder, and his service as the Presiding Archbishop-Abbot of the Order. As a Catholic faith religious community, the Order of the Most Holy Mary Theotokos (O.SS.T.) has a great devotion to Mary the Mother of God and is dedicated to promoting devotion to the Blessed Virgin Mary, under her special Orthodox title, the Theotokos. Theotokos in Greek means "God-bearer". The Old Catholic Marianists honor Mary under that title and seeks to live her example of openness to the will of Almighty God and the promptings of the Holy Spirit. The Jerusalem Cross in the upper right corner of the shield, also known as Crusaders' cross or the "Five-fold Cross", is a heraldic cross or Christian symbol consisting of a large cross potent surrounded by four smaller Greek crosses, one in each quadrant. The symbolism of the five-fold cross is variously given as the Five Wounds of Christ, Christ and the four quarters of the world, Christ and the four evangelists. The Jerusalem Cross is a Christian symbol designed over time after the death of Jesus. Its primary use in history has been for heraldic or military use, which accounts for its other term, Crusader's Cross and serves to symbolize Archbishop Jangro’s career as an Army officer and civil servant. Throughout the Middle Ages and afterward, the Jerusalem Cross was used as a symbol of the expansion of Christianity to all four corners of the world. The image is said to represent Christ as the main cross and his four evangelists: John, Luke, Mark and Matthew. Some Christians point to the five crosses as referencing the five wounds Jesus sustained during the Passion. The chalice symbolizes the central place of communion in worship and to the life of the Church. Hence its placement in the middle or center of the shield. It serves as a reminder of the ministry of each person and the importance of evangelism. The word chalice comes from the Latin word 'calix' meaning cup. The name of the cup used in the sacrament of the Lord's Supper. The chalice is a symbol of Holy Communion and the forgiveness of sin won by Christ's blood shed on the cross. The Lord’s Supper is symbolized by a chalice of wine with the bread rising above it. The chalice used for the celebration of the Eucharist contains wine mixed with a little water over which the priest repeats the words of consecration, "This is my body" and holds up the chalice for the congregation to see. The faithful believe that the wine becomes Christ's blood (as the bread becomes Christ's body). The ritual is extremely important and reminds us that all seven sacraments—Baptism, Confirmation, Holy Communion, Confession, Marriage, Holy Orders, and the Anointing of the Sick—are the life of the Catholic Church. Each sacrament is an outward sign of an inward grace. When we participate in them worthily, each provides us with graces—with the life of God in our soul. In worship, we give to God that which we owe Him; in the sacraments, He gives us the graces necessary to live a truly human life. The Chalice is symbolic of the Consecration. Reference to the Chalice Symbol in the Bible, "You shall consecrate yourselves therefore and be holy, for I am the Lord your God." (Leviticus 20:7) This is symbolic of Archbishop Jangro’s consecration to the Sacred Office of Bishop in the One Holy Catholic and Apostolic Church. In the Carolingian, Byzantine, and Gothic art periods a person depicted holding a chalice signifies that they are set apart from evil, have turned to the Lord, and are God's servant. The Pallium symbolizes the office of Chief Shepherd and Successor to the Good Shepherd who takes upon His shoulders the sheep of His flock and lays down His life for them. This Pallium is custom handcrafted of genuine natural-colour Wool, with the tips of the lappets being genuine black Silk. The six crosses are embroidered entirely by Hand with Perle Cotton. The Pallium draped around the shield symbolizes the shepherd's watchfulness, Christian faith, Episcopal jurisdiction, and pastoral authority. The display of a cross behind the shield is restricted to bishops as a mark of their dignity. The cross of an ordinary bishop has a single horizontal bar or traverse, also known as a Latin cross. The archiepiscopal cross behind the shield has two bars instead of one. Such a cross may be borne before him in liturgical processions. Gold (Or) symbolizes generosity and elevation of the mind. On the left side of the banner below the shield, the first two letters, Chi (Χ) and Rho (Ρ), of the Greek word for Christ (Χριστύς). The Chi-Rho emblem can be viewed as the first Christian Cross. On the right side of the banner below the shield, the first and last letters of the Greek alphabet which signify that Jesus is the beginning and the end of all things. "I am Alpha and Omega, the beginning and the ending, saith the Lord." The Black (Sable) coloring of these two symbols represents constancy. Catholic bishops use a motto in their arms. The motto is a statement of belief. A Bishop’s role is to serve and not to be served. Jesus’ teaching is holistic. His concern is for that holistic service so vital to human welfare. Archbishop Jangro feels the call of God’s Holy Spirit, the excitement of a new vision, and the joyful burden of the responsibility. This is the nature of service and sacrifice…the deepest meaning of diakonia. 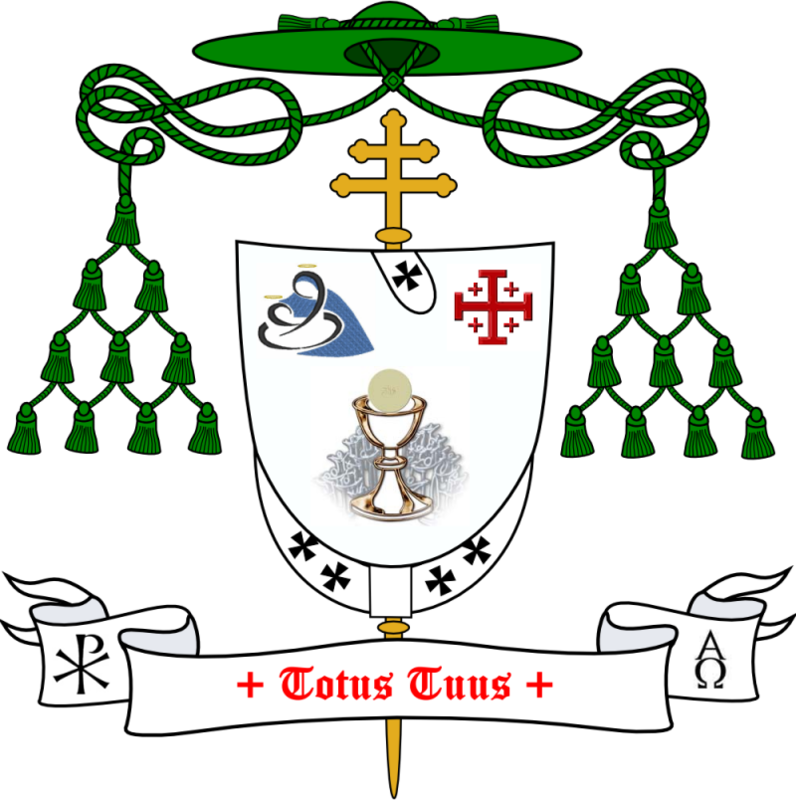 Archbishop Jangro’s Episcopal motto: “Totus Tuus”, is depicted on the banner below the shield. It means "totally yours" and expresses his strong Marian devotion and his respect for Saint Louis de Monfort and the Mariology in his works. It is not only an expression of piety, or simply an expression of devotion, it is deeply rooted in the Mystery of the Blessed Trinity. This motto is borrowed from the Marian consecrating prayer as found in the book “True Devotion to Mary” by Saint Louis de Montfort. The complete text of the prayer in Latin is: "Tuus totus ego sum, et omnia mea tua sunt" ("I am all Yours, and all that I have belongs to You"). The Red (Gules) lettering on the motto banner symbolizes strength and magnanimity. The Great Mystics—men and women of all ages whose lives have embodied profound union with God—insist that the transforming power of Divine Love is available to everyone. Contemplative prayer is a journey into the heart of God—and into a life radiant with love lavishly shared with others. Answering the contemplative call can lead us to the beauty and splendor of the Divince presence.